Pro Paver Clean & Seal has been exceeding customer expectations in the Bay Area since 2004. Whatever the condition of your pavers or travertine we have the tools and know-how to get the job done! Be sure to check out our reviews on sites such as: Angies List, BBB, Google +. Pro Paver Clean & Seal always uses the very best products available. 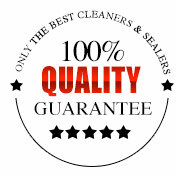 We only work with the most reliable and highly rated cleaners and sealants on the market. In fact we have sealed over 2.5 million sf of pavers and travertine with Seal N Locks award winning sealer! Few companies can say that. Be sure to do your research and hire an experienced company or you could end up spending double. We’ve seen it all after coming to save the day when another company buchers the job. If you’re in the Tampa Bay Area, talk to us first. We’ll be happy to give a free estimate or just give some professional advice. 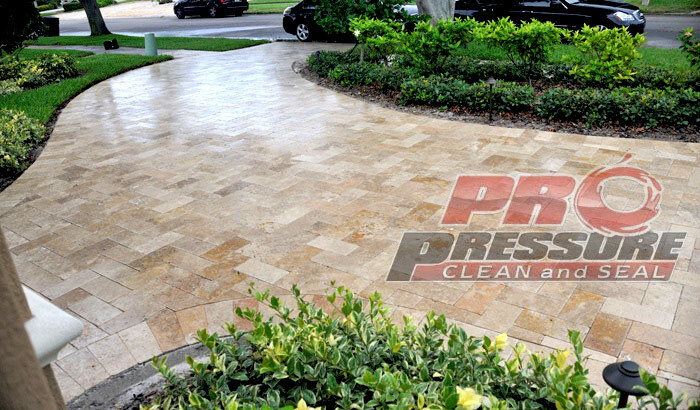 Pro Paver Clean and Seal is proud to be Tampa Bay’s preferred source for Brick Paver and Travertine Paver sealing and restoration since 2004! Why should you seal your pavers? Pavers are a beautiful addition to your home. Interlocking concrete, brick and Travertine Pavers bring a beauty to your home that a plain concrete pool deck or driveway cannot, and pavers enhance the homes curb appeal and value. However, pavers will get dirty and stained if not sealed. The sun fades the colors in the surface. Oil and fluids will seep into the pavers and can be very difficult to remove after time. The surface will stay wet longer and mildew and algae will grow and begin to stain the surface and grow between the joints. Sealing will minimize that so you dont get whats shown in the picture below. 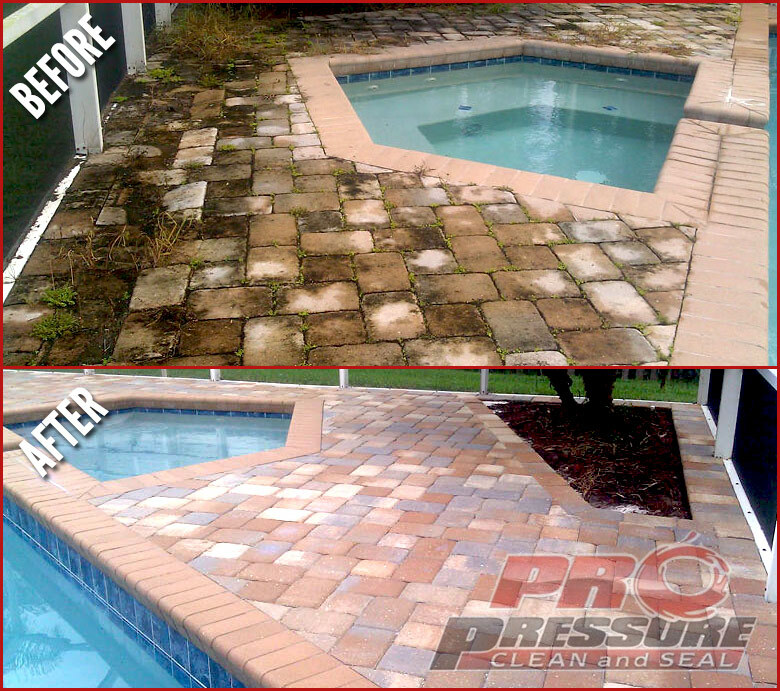 Pro Paver Clean and Seal was one of the first companies in the Tampa Bay area to use an environmentally safe, non-solvent paver sealer. Unlike solvent based paver sealers, Seal n Lock has very low Volatile Organic Compounds (VOC’s) which are bad for the environment according to the EPA. This revolutionary paver sealer can also be used on the same day the pavers are cleaned. No more waiting days for the pavers to dry out. No glossy surface that can trap moisture and cause milky white spots later on due to moisture trapped under the sealer. You can use your pool the next day and your driveway in 48 hours! It can also be applied over previously sealed pavers depending on how worn off the sealer is. (unless they are white and cloudy, then they need to be stripped-https://www.propaverseal.com/paver-stripping-restoration-travertine-brick-paver/)You can read the Seal ‘N Lock story at Sealnlock.com. Clean with very hot high pressure water and a rotary surface cleaner for very deep cleaning, along with a broad spectrum fungicidal agent to kill any mildew or algae that is growing in the joints. Clean sand is washed into the paver joints to fill them to aproximately 1/8 to 1/4 inch below the chamfor edge. Sand is very important in the joints. It keeps them from shifting and is crucial to keeping your pavers level. It is not supposed to look like grout. See some of the pics in the gallery for why not. We vacuum any sand and dirt out of your pool because who wants to do it themselves. If you are looking for the cheapest cost or the lowest price is your only goal, we may not be the right company to call for your project. We make every effort to give you the best quality and value for your money and firmly believe that you get what you pay for, especially in this industry. There are numerous new companies using Seal N’ Lock but without the proper technique you might end up paying double when you have to call a professional to fix what an inexperienced company ruined. We are the most experienced in the Tampa Bay area. If you go with us, you will definitely see the value for your hard earned money! *Sometimes the amount of calls we get are overwhelming and we can’t personally come out to look and might have to get measurements online (Verified through several sites.) We come prepared for any eventuality and rest assured, you get the same service and guarantee. Pavers can bring an entirely new look to your home’s landscaping. Interlocking pavers can be made from concrete, brick, and travertine. Pavers give homes a sophisticated curb appeal that standard concrete slabs cannot. It is important to know, though, that pavers will become stained, dirty and possibly faded from the sun, get stained by oil, and generally ugly if they are not sealed properly. We perform numerous paver restoration jobs for clients whose pavers were not sealed as they should have been. To see examples of poor sealing jobs go to our paver stripping & restoration page . You can also drive through many neighborhoods and see some of these same examples. Don’t allow yourself to be one of these people who are taken advantage of by un-knowledgable or even unscrupulous contractors. To learn more about Pro Paver Seal and to get a free quote for paver sealing- call us at 727.432.2501.